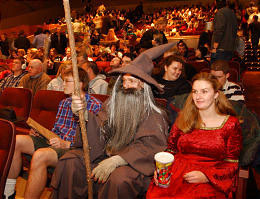 Join your fellow Ringers from around the world as we gather to experience opening night of ‘The Hobbit: The Desolation of Smaug.’ For folks in the US, that’s happening at midnight tonight, and there are Line Parties happening at theatres across the country. Share your Line Party photos and fun by using #TORnHobbitLP on Twitter, Facebook, and Instagram. Share pics of costumes, your responses to the film, and other activities happening in your Line. After opening night, share photos from your Line Party with us at spymaster@theonering.net.